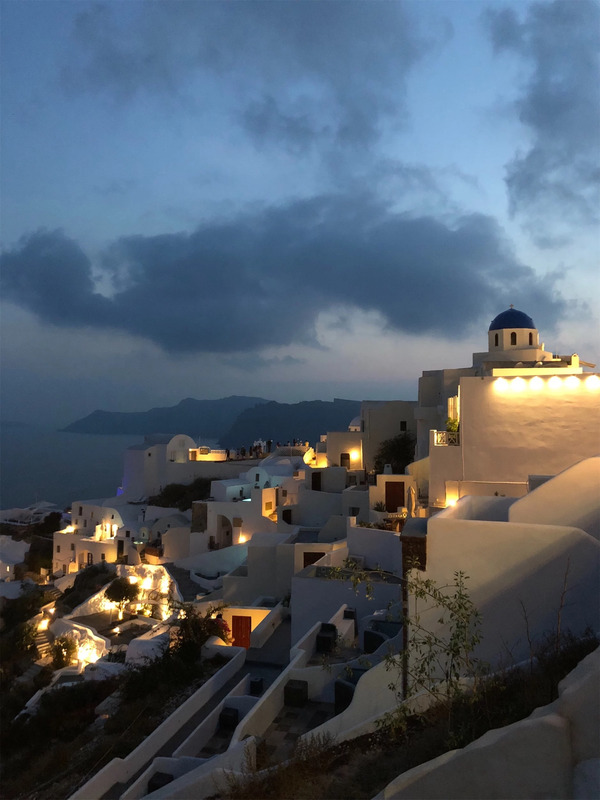 Often described as "the supermodel of the greek islands" and "honeymooners dream", it's no wonder Santorini welcome millions of tourists from all over the world every year. Boasting breathtaking caldera sunset views from picturesque towns situated at the top of steep cliffs, I can tell you this is like not other destination I've visited. 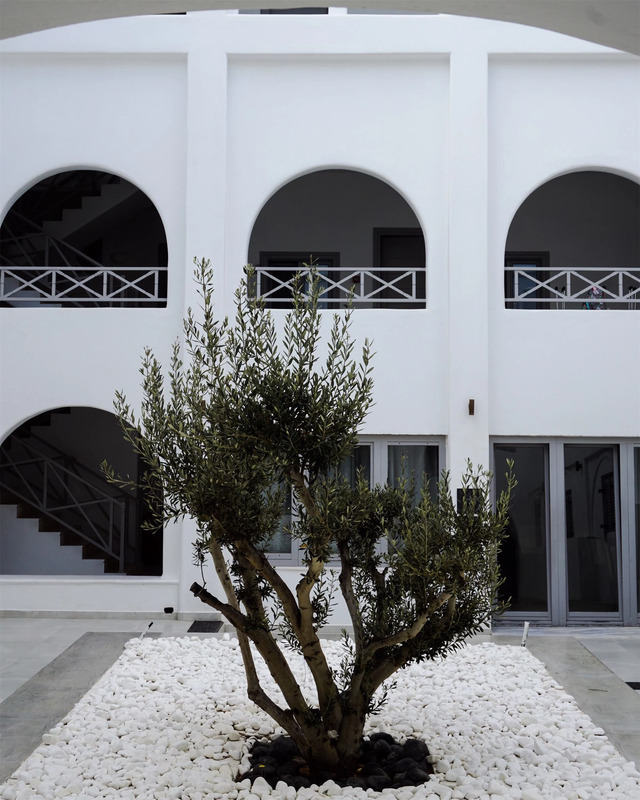 And to really submerge into the beauty of this island, whats better than choosing to stay at a stylish boutique hotel in Santorini. 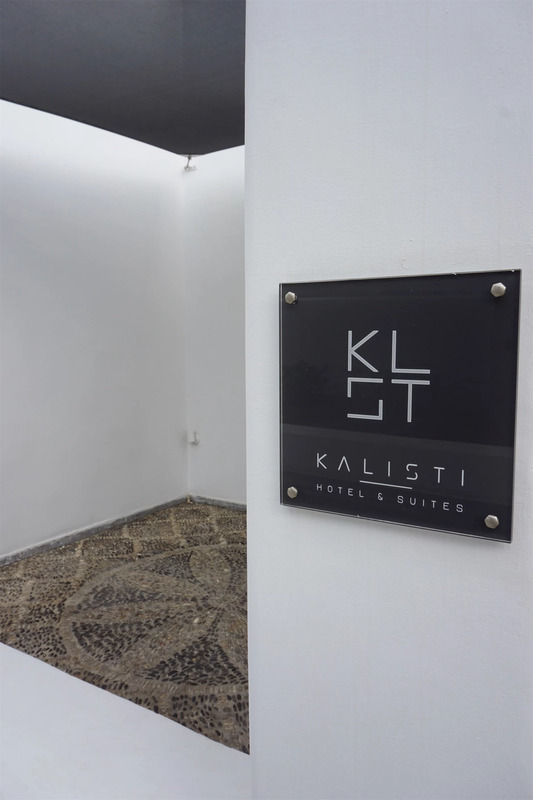 "a charming boutique hotel in the heart of Fira"
The experience with four star Kalisti Hotel & Suites start just outside the arrival hall of Santorini airport. The hotel has its own transport service which conveniently brings you to (and from) the hotel, and the best, its included in your room rate. 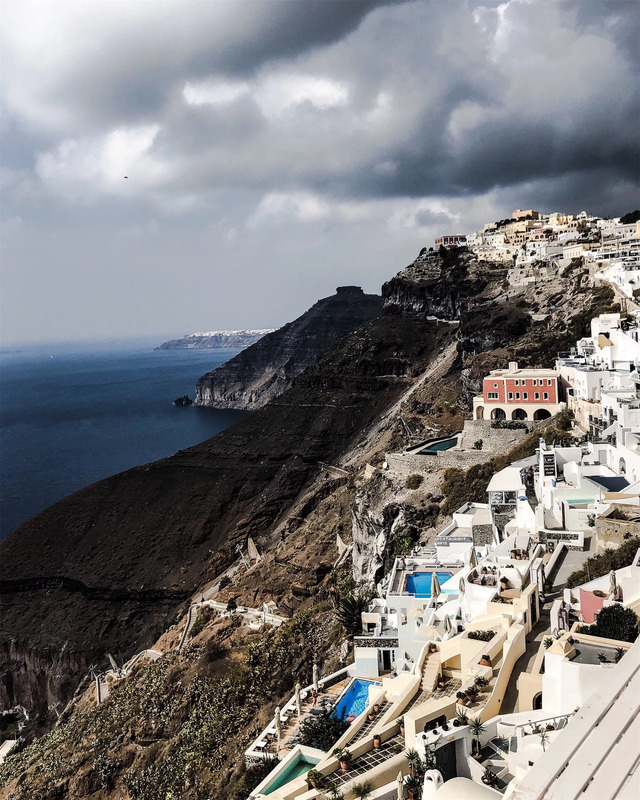 Only a 15 min drive from the airport is Fira, the capital of Santorini. 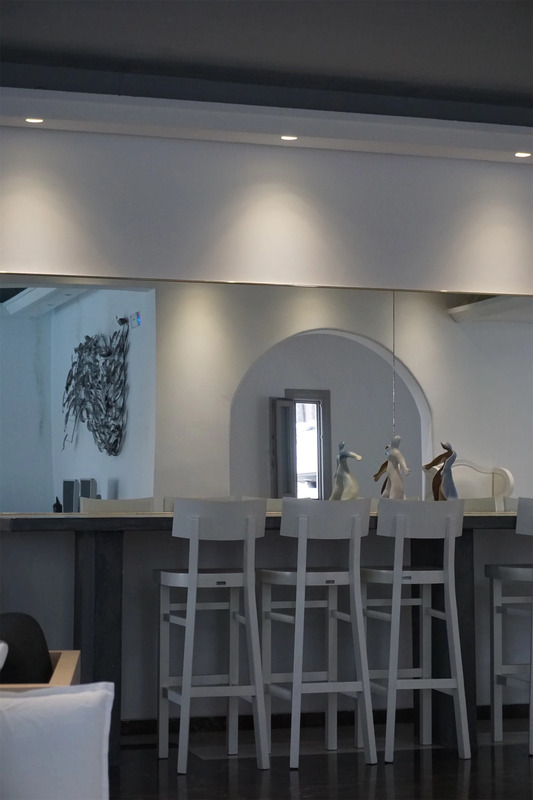 The hotel is located in the heart of this town which makes it a great hub for exploring Fira and the rest of Santorini. Arriving the hotel is a nice experience on its own. 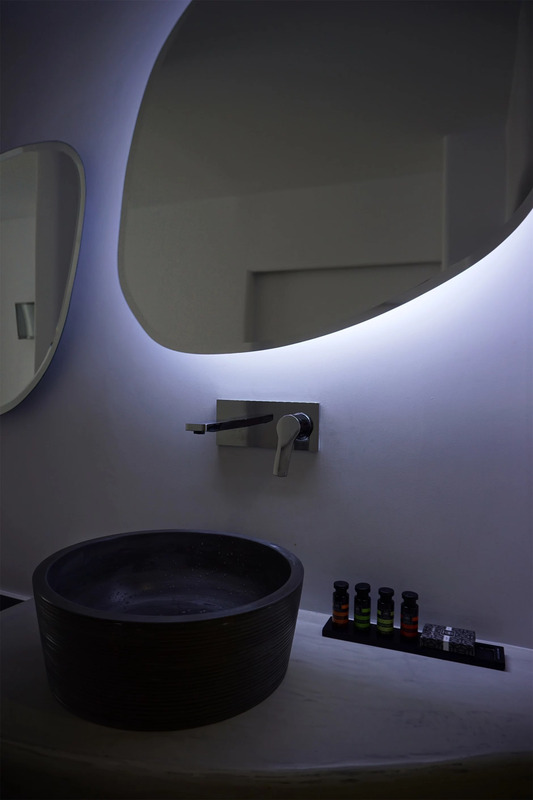 The beautiful and minimalistic aesthetics of the hotel are inviting, and stays consistent throughout the whole hotel which creates a unique and luxurious feeling. So does the greeting by smiling staff members carrying the baggage and giving a quick tour around the hotels main areas and features of the room. And while talking about rooms, this hotel has quite a few options.
" 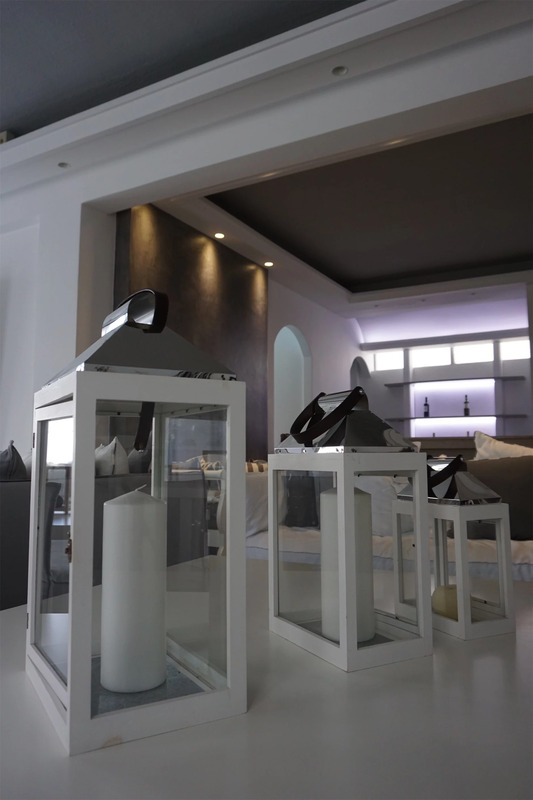 rooms and suites designed to meet different needs." 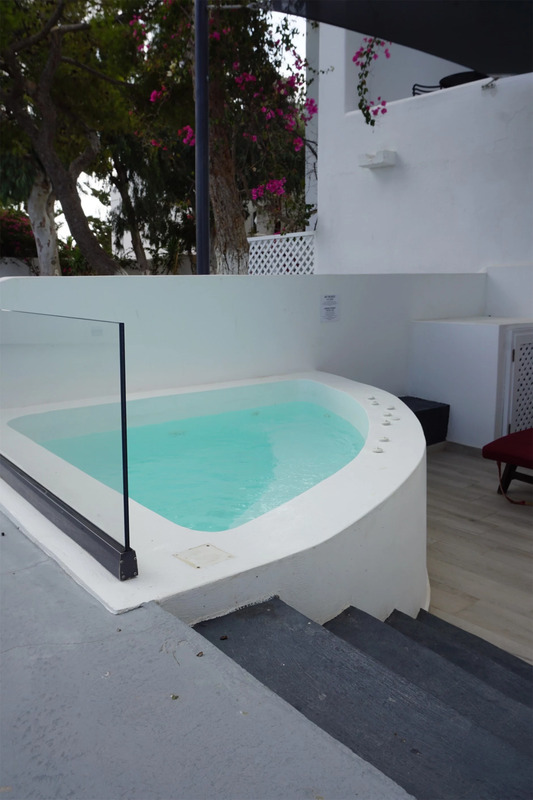 There is several room categories to choose from, including suites with private pool/jacuzzi and seaview. We were accommodated in a Double Room with Pool area views. 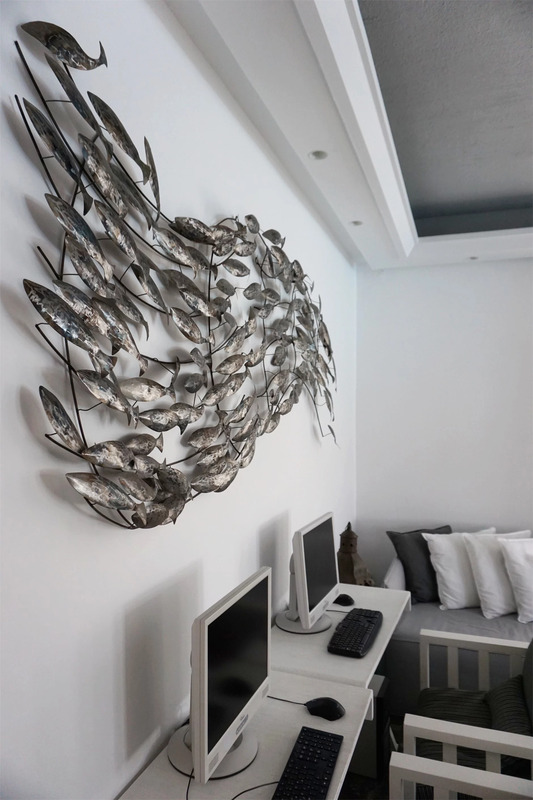 All rooms are nicely decorated in a calming modern Aegean Cycladic style. 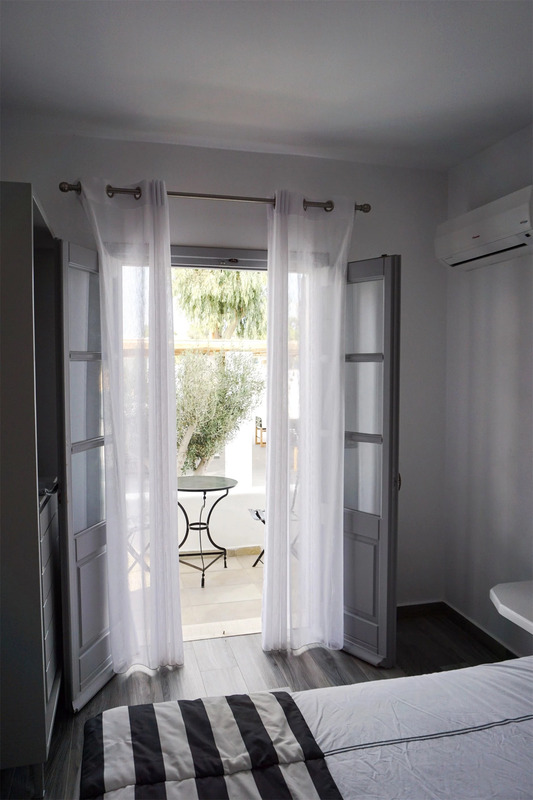 My inside tip for choosing a room at the property is getting a room at the top floor as the ground floor tends to be more busy outside the room with people passing by. Balcony, Room service, Air condition, Wifi , TV, Duvets and extra pillows, Slippers, Hair-dryer, Toiletries, Mini Bar, Cave style shower, Make-up table, Locker with Safe. 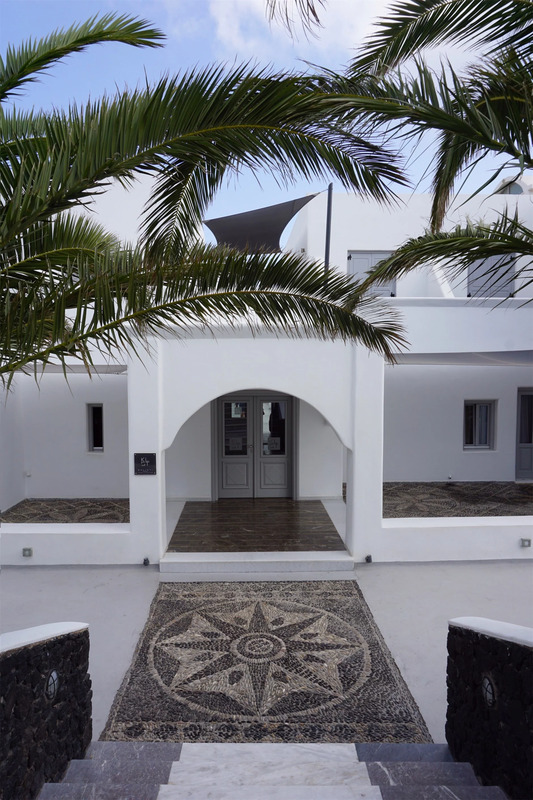 "lazy days by the pool and memorable evenings exploring Fira town"
The Hotel property is not very large, so you never have to walk long distances whether it´s for breakfast, a drink in the bar or a swim in the pool. The hotel only has stairs between the levels which is something to have in mind if elevator is crucial. The included breakfast buffet is located downstairs, and has a wide variety of food to choose from as well as a bar serving delicious barista coffee. I was delighted to find several local dishes at the breakfast buffet, and they changed the selection of food from day to day. 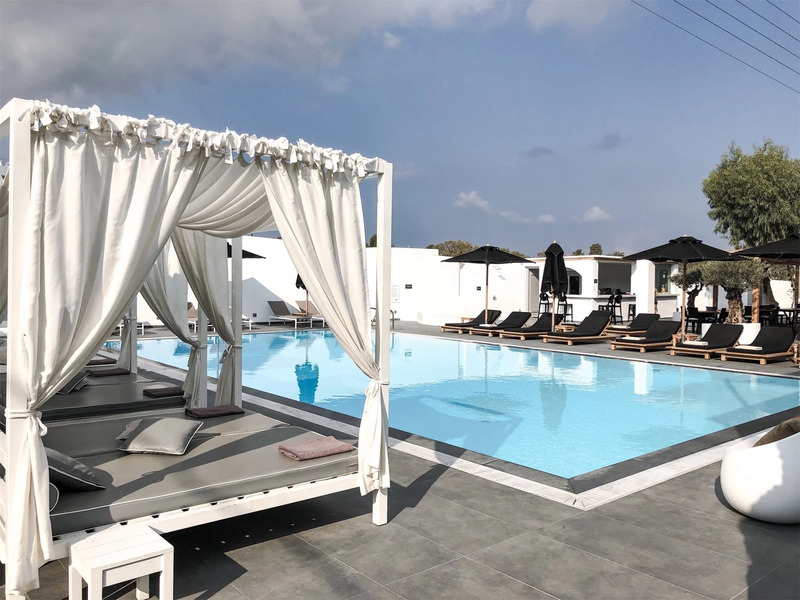 The main feature of the hotel is the pool area which includes the biggest swimming pool in Fira, heated jacuzzi and and a bar serving alcoholic beverages and light snacks. Other activities available on site is massages and table tennis. The reception can help with arranging excursions. 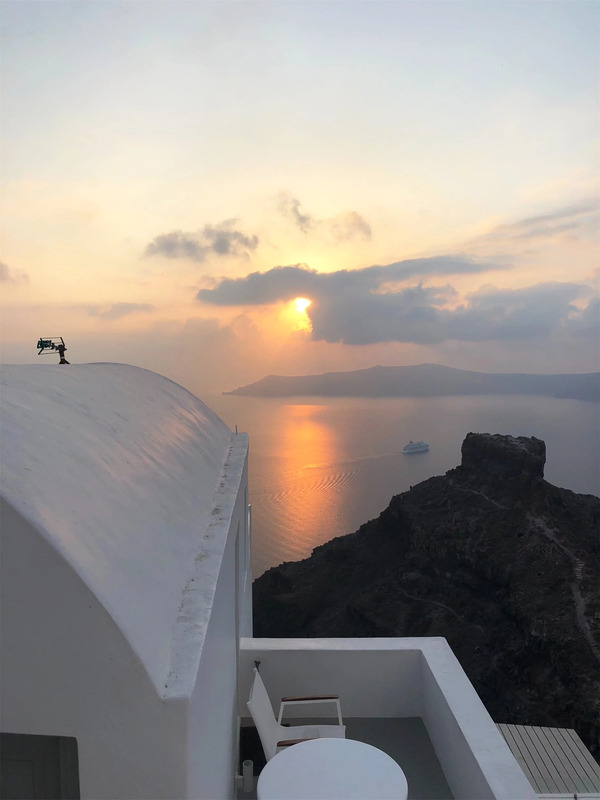 "Exploring the higlights of Santorini only footsteps outside the hotel"
The hotel is only a few minutes away from the stunning caldera rim of Fira. 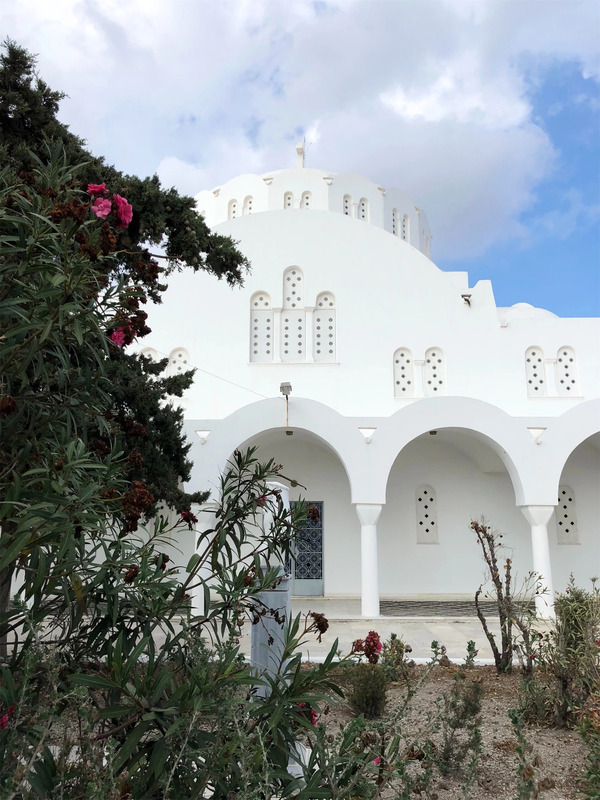 Here you can find restaurants and cafés with spectacular views, souvenir shops and stores as well as churches and historical museums such as the Museum of Prehistoric Thira. 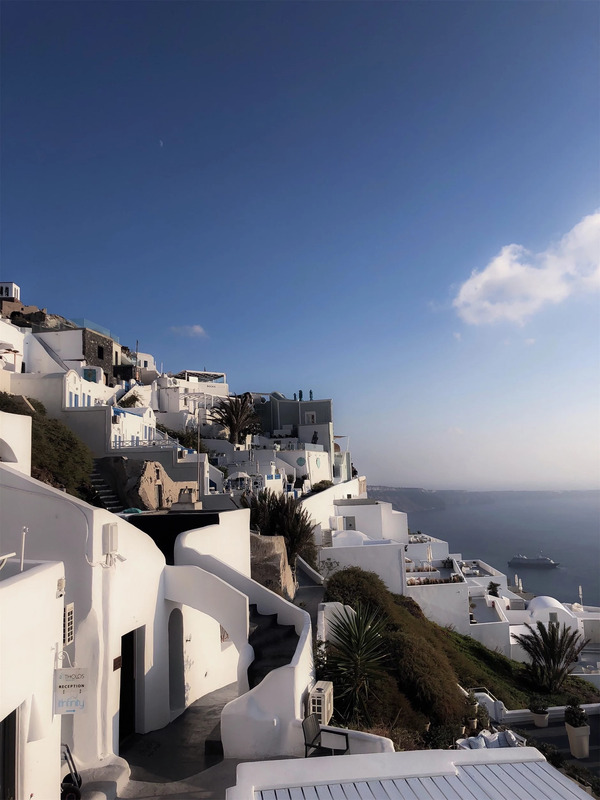 There´s also a cable car service which bring you between the port of Fira and the town, or you can simply walk down and up the stairs to get your daily steps done. in fact there are great experiences waiting for you by using your feet only. 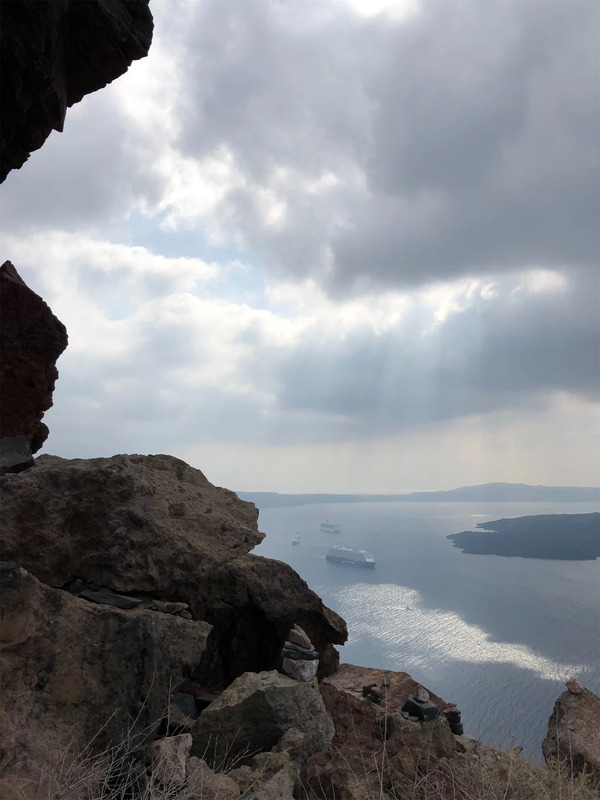 To walk along the narrow paths along the caldera rim you will not only experience breathtaking views along the trip, but also nice buildings, churches and so many cool spots to take your photographs. Starting in Fira town you walk along the Golden Street and continue to beautiful nearby towns like Firostefani and Imerovigli. Ending your trip in Imerovigli watching the sunset while having a better dinner is something you will remember for life. Walking time Fira-Firostefani-Imerovigli approximately 30 minutes. 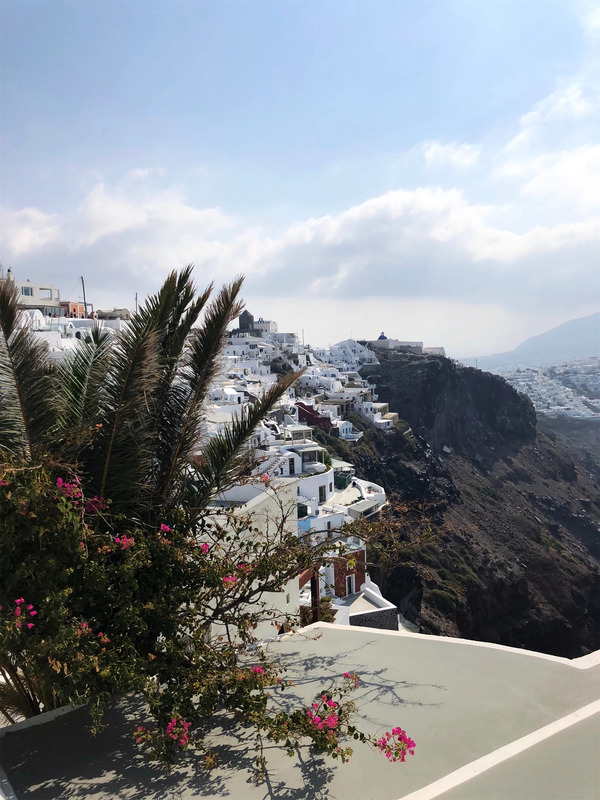 The famous town of Oia is also reachable by foot, although a much longer still very beautiful hike trail. Expect around 2 hours and 30 minutes for this trip. Using taxi or bus of course take you to Oia in much less time. No more hassle dealing with all the different currency rates. This easy-to-use currency converter is a must when traveling, especially for shopaholics. It will quickly convert any amount into your local currency. It even works offline with the last stored currency rates. Who has not experienced communication issues when traveling, or been wondering what those signs are telling? Google translate is your friend and will help you out in most cases. The app offers good functionality and knows many different languages. City maps are a great way to get to know a city and where the points of interest are located. With this app downloaded you might as well forget your traditional paper map in your hotel room. Do you wonder what restaurant to pick for your dinner or what sights to spend your time and money on? Tripadvisor collects thousands of helpful user reviews on hotels, restaurants and sights. Just type your destination and start making your own bucket list for your trip or write a own review on something to help thers. This is a offline GPS app which will save you a lot of money compared to other navigation apps that are dependable on roaming. Choose the country or origin that you plan to visit and download the map for the selected area beforehand. This is a handy app where you can collect and organize all your travel information such as flight schedules, hotel adress and chech-in/chech-out times. This Wifi finder app collects password and locations of hot spots all over the world. If you are traveling to a large city you might as well check for a public transportation app for your destination city. It will make you more efficient and less likely to end up in a total different spot than what was intended. Some of these app also have the feature to buy digital tickets. Several international airports have their own app which collects all relevant information like services, departures/arrivals, estimated queue time through the security check and so on. Can make your time at the airport more efficient and less stressful. If you like to do some shopping when traveling make sure to be a smart one. A price comparison app like "Pricerunner", "Prisjakt" or similar will help you choose whether to buy now or wait until your back home. 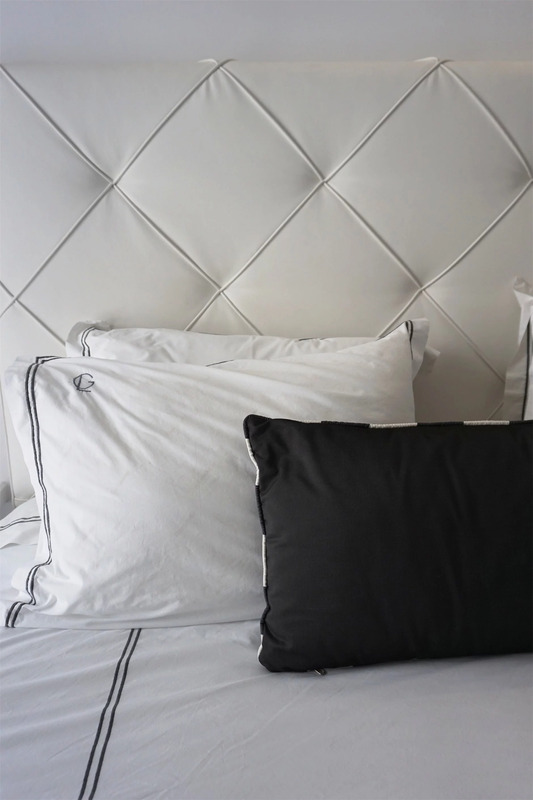 Not all deals end up being the best deal and if your luggage capacity is limited you should at least make sure to buy only the things you save money on or can't be bought at home. 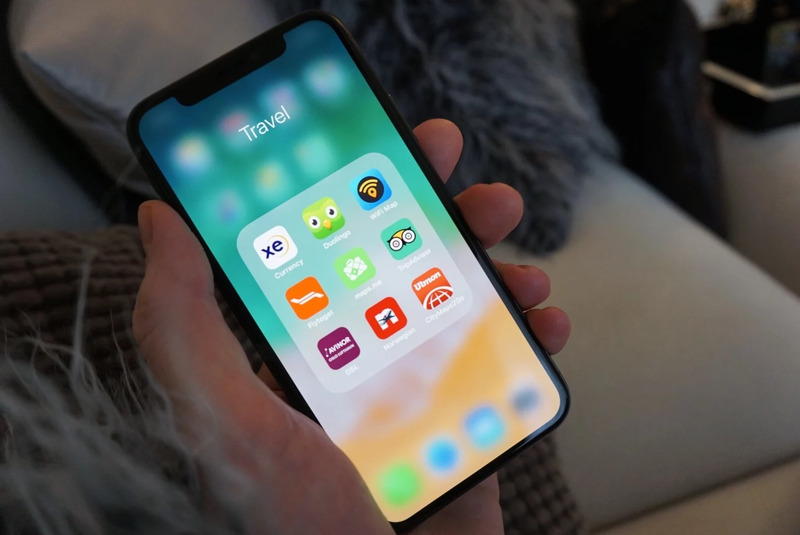 Noen apper er mer nyttige enn andre og her kommer tips til noen av de beste appene jeg mener du bør å ha installert på telefonen når du er ute på reise. Alle er dessuten gratis å laste ned fra Appstore. Shopping er som regel en del av enhver reise. Denne valutakonverterer er veldig kjekk å ha når du trenger å finne ut hva prisen er i din valuta. Rask, enkel å bruke og med oppdaterte kurser. Denne henger litt sammen med XE currency. Det kan være lurt å sjekke om du virkelig gjør et godt kjøp ved å sammenligne med butikker i Norge. Er ikke alt som er lønnsomt å handle i utlandet. Skjønner ikke servitøren engelsk, eller er menyen uforståelig? Og hva står det egentlig på det skiltet der? Det er mange situasjoner hvor man kan ha bruk for en oversetter. Denne er rask og enkel å bruke med god funksjonalitet og mange språk. Det kan være greit å kunne hvertfall noe grunnleggende av det lokale språket på reisemålet. Med denne appen starter du med enkle ord og setninger for så å jobbe deg gjennom nivåer etter hvert som du mestrer både å skrive, forstå og snakke bedre. Jeg garanterer deg at det aldri har vært mer moro å lære språk før. Om du drar til en storby er det greit å ha et oversiktlig bykart tilgjengelig til enhver tid. For du vet du kommer til å miste det kartet du puttet i lommen et sted. Lurer du på hvilke restauranter som er gode i nærområdet? Dette nettsamfunnet er fullt av tips til alt på ditt reisemål: severdigheter, restauranter og hoteller. Du kan finne mye viktig informasjon ved å lese gjesteanmeldelser. Google translate er en venn i nøden, men på reise kan det fort bli veldig dyrt å bruke datatrafikk på GPS. Med denne appen derimot har du kartene tilgjengelig offline slik at du slipper å bruke masse penger på å finne nærmeste dagligvare. 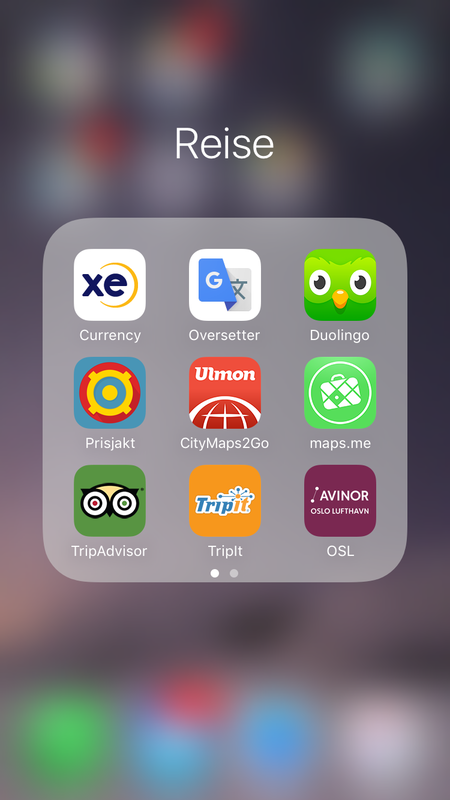 En kjekk app som hjelper deg med å organisere og samle informasjon om hele reisen på en oversiktlig måte. Du kan legge inn informasjon om flyvningene dine, når du skal hente og levere leiebilen, Innsjekk og utsjekk på hotellet osv. Det kan være ganske forvirrende å lære seg et nytt linjekart på 1-2-3. De fleste storbyer har egne apper med rutekart og ruteplanlegger. Kjekt å ha lastet ned på forhånd. Veldig kjekk å ha for å finne informasjon om avganger, ventetid i sikkerhetskontrollen, servicetilbud osv på flyplassen.